A Memorandum of Understanding shows that two or more business partners are serious about taking the next steps towards a mutually beneficial agreement. It describes the project they intend to work on together and what each party's expected contribution will be. You're a business owner about to partner with another business. You own a small business and commonly partner with others. Another business has asked to work with your business. You and another company want to work on a project together. Making a Memorandum of Understanding is easy. Using your Rocket Lawyer account, you can make, edit, share and sign your document online. The finished document can also be downloaded and printed. 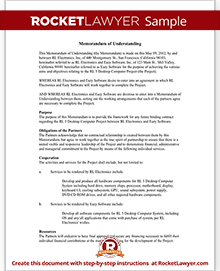 What is the purpose of a Memorandum of Understanding (MOU)? A MOA helps you and your partner think through how a future agreement may work before the actual legally binding agreement is signed. A Memorandum of Understanding defines a business project you are planning to undertake with another partner or partners. Usually, the project is short-term and has a forecasted end date. The MOA defines who the parties are and what their expected contributions will be. It also defines the project and the purpose of the project. What information is included in an MOA? Creating a Memorandum of Understanding is simple using Rocket Lawyer. By the time you are ready to make an MOU, you've likely already had the conversations to know what you want to include in the document. Dates. When the MOU will start and when it will end. Contact information. Contact information for all parties involved. Name of project. Often businesses use a project name rather than using their company names. Contributions. What each party will contribute to the project. Other contributions. What financial, material or labor resources each party will contribute. The rest of the MOU is automatically generated for you. If you need to make other alterations, you can download it in Word and edit the document. Generally-speaking, the short answer is no. A Memorandum of Understanding outlines the intention of making a legal agreement, but it is not a legally enforceable document itself. While it is not enforceable, it is a powerful tool for helping you outline what the final, legal agreement will include. In most cases, unless money is exchanged an MOU will not stand up in court if challenged. You may want to seek legal advice to help determine the enforceability of your Memorandum of Understanding. Why should I take the time to make an MOU? Since MOUs are often not binding and just a "contract to contract," you may be wondering why you should take the time to make the document. The first benefit of creating this document is that it makes you and your future partner think through the details of your future business arrangement before you enter a binding agreement. Plus, it gives you a preview into what it may be like to work with the potential partner or business. What is their work ethic? Do they seem respectful of your time? Do they take too long to make decisions? Do they appear reluctant to want to put anything into writing? Can they attribute enough financially to support the project? It is a good time to take the opportunity to get to know your future partner before you take the next step. A contract or Partnership Agreement is usually more enforceable than a Memorandum of Understanding and contracts are generally binding. Once an agreement is made, often a Joint Venture, the legal relationship begins. Often money or resources are exchanged and work on the project begins. While an MOU usually doesn't carry much weight in court, the formal contract or agreement often does. 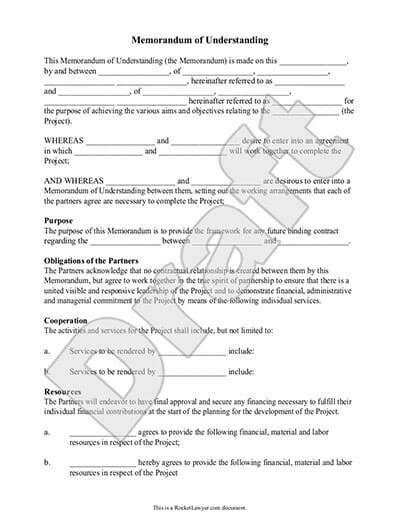 A document similar to a MOU, called a Letter of Intent is often used to show intent to purchase all or part of a company. Like a MOU, it is a document that outlines a future agreement. If you have any questions about what's right for you and your business, we can connect you with a lawyer for quick answers or a document review. Our step-by-step interview process makes creating a printable Memorandum of Understanding easy.